Your canine partner is more than an asset, he’s a team member. A custom-fit vest for your canine is as critical to his safety as your own, but knowing how to order one can be tricky. How do you measure, and what’s most important? It’s important to remember that your canine’s protection vest is meant to protect him against various threats, but many aren’t designed to withstand the impact of a bullet. 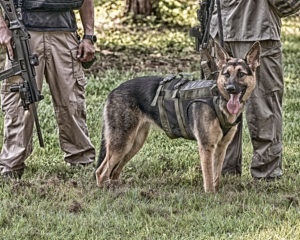 The weight of bulletproof plates would be too heavy for most canines to carry with them, but good protection vests still protect your pooch against threats such as shrapnel and blades. Comfort should be a top priority when choosing a vest. Like their owners, canines deserve to be comfortable in the line of duty. Dogs are more prone to becoming overheated than humans, so their vests should be made out of extremely breathable, flexible material to keep them cool and dry while working. A lightweight vest also helps prevent your dog from fatiguing just by wearing his equipment. Harness and collar should be easy on/off. Not only should the vest you choose not restrict your dog’s motion, it shouldn’t be difficult to remove. If a vest is comfortable enough, your canine should be able to wear it once released from his collar harness and still enjoy the same speed and agility he would without it. Custom reigns supreme, but vests should be adjustable. For the ultimate in secure fit and abdominal protection for your canine partner, a fully customized vest is the best solution. Even when customized, vests should be made with several adjustment mechanisms, preferably out of a strong, durable material like hook-and-loop VELCRO that will withstand many uses. Just like humans, K9s can gain and lose weight making adjustability in gear a must. Need help talking through the specifics of a custom canine protection vest order? Vel Tye is your one-stop-shop for protection gear, specializing in custom, American-made equipment. Give our Virginia Beach-based team a call today to talk about your dog’s needs.